The release of Google's "Panda" algorithm update has gone global, affecting all languages except Chinese, Japanese and Korean. It's not immediately clear which non-English content sites will be most affected. Rolled out in the U.S. in February and expanded to all English-language sites in April, Panda downgraded the page rankings of low quality sites and has forced many content sites to give up on growing to scale in the Google search ecosystem. Companies like Demand Media, which is now firing freelancers, and Mahalo are looking to social networks, YouTube and apps for their traffic growth. Google anticipates that 6% to 9% of queries will be affected -- the initial Panda release affected nearly 12%, Google has reported. "For many months, we’ve been focused on trying to return high-quality sites to users." Armit Singhal, Google Fellow, wrote on Google's blog today. 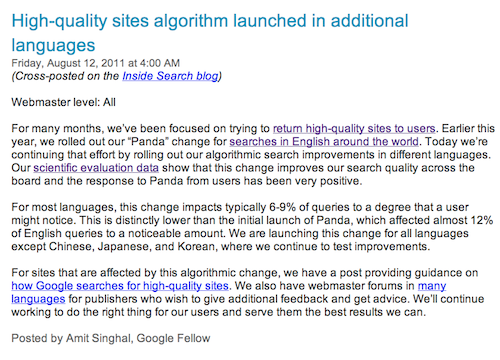 "Today we’re continuing that effort by rolling out our algorithmic search improvements in different languages." The February update prompted Suite101 CEO Peter Berger to draft an open letter to Google's Matt Cutts defending Suite101's content. Berger noted that following the Panda release Suite101's overall traffic declined more than 30%.